Saudi Arabia is reportedly nearing a decision to invest in U.S. liquefied natural gas export plants — a move that could further a shift in energy flows between the two countries while underpinning one or more of the American projects that backers hope to commercially sanction this year. Saudi Arabian Oil Co., or Saudi Aramco, has developed a shortlist of at least four U.S. liquefaction projects with an eye toward announcing a deal for equity stakes in the first half of 2019, The Wall Street Journal reported on Jan. 8, citing people familiar with the matter. 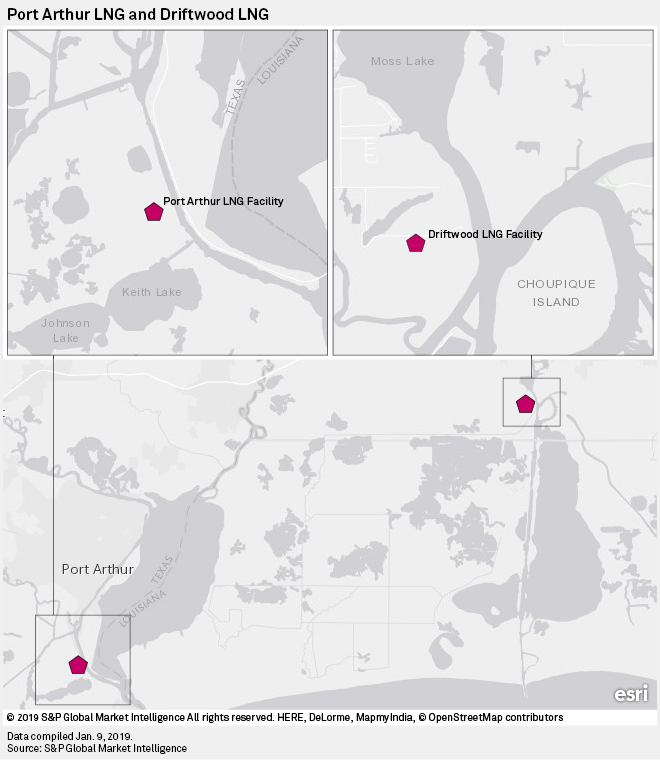 Two projects Saudi Arabia is reportedly considering include Tellurian Inc.'s proposed Driftwood terminal in Louisiana and Sempra Energy's Port Arthur facility in Texas, according to the Journal, which said the value of the potential investments was unclear. 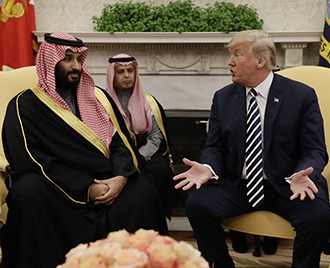 President Donald Trump meets with Saudi Crown Prince Mohammed bin Salman on March 20, 2018, in the Oval Office. A Saudi investment in the burgeoning American industry could make sense for numerous reasons, LNG experts said. Investing in a segment of the U.S. energy industry that the Trump administration has sought to grow could present Saudi Arabia with a way to strengthen ties with America, after a tumultuous 2018 that saw mounting global pressure on the kingdom following the slaying of Saudi dissident Jamal Khashoggi. "They have a lot to make up for given all the geopolitical frictions after the murder of Jamal Khashoggi and other recent tensions, so I think that's certainly an important component," Akos Losz, senior research associate at Columbia University's Center on Global Energy Policy, said in an interview. A potential investment could also be influenced by Saudi Arabia's diplomatic rivalry with Qatar, Losz said. Qatar, which recently decided to withdraw from OPEC, is a top global LNG exporter and is the majority-owner of the proposed Golden Pass LNG export terminal in Texas with partners Exxon Mobil Corp. and ConocoPhillips Co. That project, which has all of its major regulatory permits, is considered among the front-runners to reach a final investment decision in the first half of 2019. But a deal could also advance other Saudi aims of diversifying its economy and energy supplies. Depending on how much U.S. LNG Saudi Arabia imported, the gas could free up hundreds of thousands of barrels of crude per day for exports that the country instead burns to generate electricity. That could help efforts to publicly list Aramco. At the same time, Saudi Arabia may see LNG as "a more acceptable forward-looking fuel that probably has a longer time horizon" than crude oil production, said Jason Feer, head of business intelligence at oil broker and ship broker Poten & Partners, in an interview. "In a lot of ways it's kind of a no-brainer," Feer said. "It helps geopolitically. It helps diversify their economy. It helps reduce domestic subsidies. So for the Saudis it has a lot of advantages." For U.S. companies, Saudi Arabia could prove an attractive investor as a well-financed and respected global energy market player with a big home market for gas, Feer said. U.S. LNG exports to Saudi Arabia have long been discussed as a possibility that would illustrate how American shale gas is transforming global energy markets. A deal could mark a profound moment in the energy relationship between Saudi Arabia, the world's largest crude exporter, and the U.S., which is increasingly an energy exporter. Tellurian co-founder Charif Souki said the company was marketing to Saudi Arabia in a December 2017 interview with S&P Global Market Intelligence. "We've talked to them. They've talked to us," Souki said at the time. "They're aware of what we are and what we do." A Tellurian spokesperson declined to comment on commercial matters. A Sempra spokesperson released a statement saying: "We've had strong interest in Port Arthur LNG from global LNG buyers and investors but can't comment on any commercial discussions. We are developing five liquefaction projects in the U.S. and Mexico and we expect to be one of the largest North American exporters of LNG for global markets." Aramco did not respond to a request for comment by press time. Sempra has yet to commercially sanction Port Arthur as it works to complete another project under construction in Louisiana, Cameron LNG. Cameron is expected to start producing LNG from a first train in early 2019. The company has said it plans to export about 11 million tonnes per annum of LNG from Port Arthur starting in 2023. Sempra executives said on a Nov. 7, 2018, earnings call said the company aims to own a 60% to 70% stake across its portfolio of LNG assets, which also includes plans to convert Energía Costa Azul import terminal on the West Coast of Mexico in Baja California into an export facility. Aramco already owns a massive oil refinery in Port Arthur through its subsidiary Motiva Enterprises LLC. Tellurian's model for Driftwood seeks equity partners who would buy stakes in the proposed 27.6 mtpa terminal and get LNG from the U.S. Gulf Coast that they could use for their own purposes or resell at a markup. Tellurian in recent months revised the financing structure of the terminal in an effort to entice investors, cutting down potential partners' equity buy-in to $500 per tonne from the previous $1,500 per tonne. Tellurian had previously said it planned to announce equity partnership agreements by the end of 2018. But CEO Meg Gentle said in a Dec. 31, 2018, Tellurian-produced podcast that the company still expects to commercially sanction the project in the first half of the year, with four to eight partners expected to support the first phase. The company had been "over-fixated on Dec. 31, 2018, as a deadline" and that negotiations would continue into 2019, Gentle said. "There's not really a change, per se," Gentle said. "There is simply a process that we have several counter parties that are working through."